After a 20-year journey, A Better Life, the father-son story of an immigrant gardener whose truck is stolen, finally makes it to the big screen with a screenplay by Eric Eason, story by Roger L.Simon and a nod to Vittorio De Sica. Screenplays can live long, multifaceted lives in Hollywood yet never get born. Roger L. Simon had been the father of one such child until it was adopted by Eric Eason twentysomething years later and turned into a contemporary drama, directed by Chris Weitz. A Better Life began when television and film producer Paul Junger Witt was told a story about a friend’s illegal immigrant gardener in L.A. whose truck had been stolen and was unable to go to the police for fear of being deported. It was 1989, and Simon was carrying around a newly minted Oscar nomination for Enemies: A Love Story, with all the popularity that brings when Witt called him in. “Do you think there’s a movie in that or not?” Witt queried. Simon did and by his own account jumped at it. He was a fan of Italian Neorealism and drew a great deal from Vittorio De Sica’s Umberto D. and Bicycle Thieves as he set about telling the story of a Los Angeles illegal immigrant and his son, whose chance to build a better life for them and keep his son from crime is dashed when the heart of his gardening business, his truck, is stolen. Demián Bichir and José Julián in A Better Life. Columbia sat on Simon’s script, and he continued to write for Witt on spec, with the agreement that he would direct. Andy Garcia got involved and Simon started scouting locations in the late, ‘90s but the money never came through. By the time Paul Witt finally brought on Eason (Journey to the End of the Night), Witt had carried it as a passion project for over 20 years. Eason, who grew up in New York and moved with his wife to Buenos Aires for a change of pace, comes from a filmmaking background; his aunt was an actress in the ‘50s, and he has both an uncle and a cousin with Oscars. He made some short films and his first feature, Manito, about two brothers in Latino Washington Heights, won a string of festival and nominations and awards in 2002. 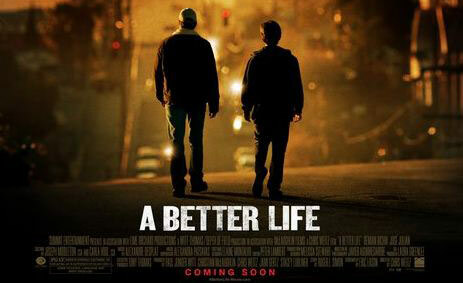 A Better Life is the first screenplay you’ve written that you didn’t direct, as well. Can you tell me how the project came to you? Eric Eason: I’d previously worked on a different writing assignment for Paul Witt and Christian McLaughlin. That project never came to fruition, alas, but a few years later Paul and Christian contacted me about rewriting A Better Life, and I jumped at the chance to work with them again. Roger Simon’s basic story and general setting held a strong attraction for me for a number of reasons, the least of which was that the national immigration debate seems to be an insoluble issue. But here was a chance to write something timely and relevant that might open some minds. How did you decide to focus the story, then? Eric Eason: I proposed a page-one re-conception of the screenplay; retaining its basic premise while greatly enhancing the father-son relationship, predicating everything around its dramatic outcome. In Roger’s draft, there was a lot going on; lots of subplots, supporting characters – Russian loan sharks, Samoan criminals – robbery scenes. It was Capra-esque in ambition and tone. For example, the hero’s dog shows up in a penultimate courtroom scene and barks at the judge (neither the dog nor the courtroom are in my version). This isn’t a knock on Roger. Simply, his draft read more like a fable and tackled many stories. My approach was to root everything in realism and focus only on the father and son story. Tell me more about that sense of veracity and the efforts you made to create it. Eric Eason: I should start by saying that I’m not Latino but my first feature film, Manito, was set in the Latino world. And one of the things I’m most proud of is that audiences and critics felt it was an honest and realistic portrayal. I wanted to bring the same sense of veracity to the writing of A Better Life. I did a lot of conventional research visiting East L.A., interviewing people face to face and over the phone. And then, before I sat down to begin the actual writing of the script, I went on LEXIS-NEXUS and culled hundreds of articles about my key subjects; stories about single parents getting deported, the failed L.A. school system, gang culture, East L.A. projects, etc. Planet5D’s DSLR Dynamics Tour Begins Tomorrow!